Let’s get this out of the way right now. This is an offer you can’t refuse. There. Now that that’s out of the way, check out this 1-16GB capacity flash drive that’s fully compatible with USB 2.0 and 1.1. It has durable solid-state storage of 10 years data retention, while hot plug & play enables you to whack, I mean install and uninstall drive anytime. The best part? The Godfather images and quotes. 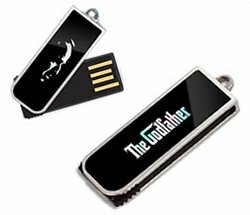 Because your data is sensitive, you need a flash drive that commands respect. If your data falls into the wrong hands, you might end up sleeping with the fishes. For those looking to be stylish while always having some extra memory around their wrist, Brando has released its new USB thumb drive with decorative crystals. 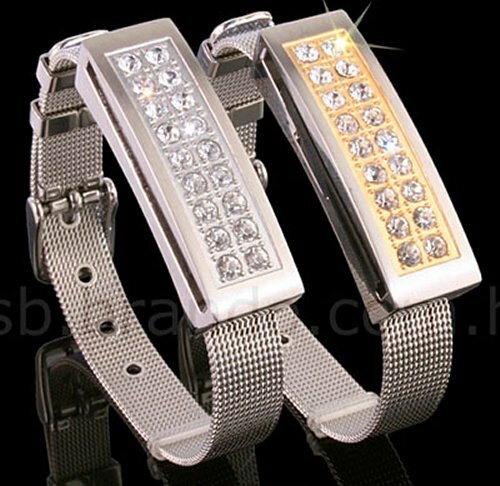 The pros: No one is going to want to steal this tacky crapped up wrist-hugger with jeweled glass bits, so your data should be safe. Cheap crap should be in again this season. The cons: You’ve got a crappy piece of jewelry and already have plenty of flash drives lying around. For $33 you could do much better and probably get 3 rows of crap “Jewels” instead of 2. It’s available in silver or gold colors and the drive supports USB 2.0, Microsoft Windows XP/Vista, MAC OS and Linux OS. Here’s a unique USB drive designed by Studioroom906. It’s covered in rubber so you can use it as an eraser. That means that if you use pencil and make a lot of mistakes, you’re screwed, as the outside of your drive will be gone. The moral of this story? Protect your data by using pens. Who uses pencils these days anyway? Pencil pushers, that’s who. Them and pencil-necked geeks. It ain’t 1957. Try picking up a pen every once in a while. You might get to like it. What’s with those guys that use pencils and then lick the tip? What’s up with that? You’ll get lead poisoning. LaCie’s latest offering makes their flash drives more portable, though you’ll need to be careful that you don’t unwittingly spend it. Our favorite droid gets a gadget makeover yet again. When is he ever going to get some respect? If he isn’t pulling aquarium duty, he’s keeping your stuff cold. And when he isn’t acting as your own personal fridge, he’s a drink server. 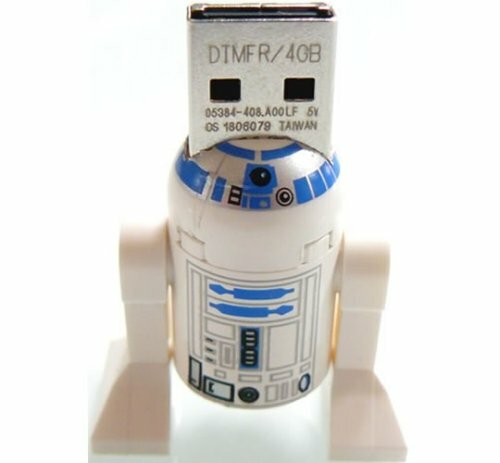 Well, now someone’s taken a Lego R2 and made him into a USB drive. Which is neat and all, but he still ain’t gettin no respect. Because when you plug the little guy into your usb port, he just looks like he got shot out of a cannon and got stuck in your laptop and should be flailing his legs. Such is the life of an overly merchandised droid. Intel and Micron’s joint venture in NAND flash technology, IM Flash Technologies, has announced mass production of 34nm, 32 gigabit multi-level cell NAND Flash device. 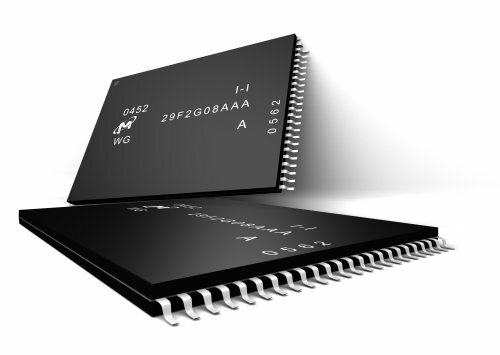 This move puts the company in the lead of Flash technology ahead of the likes of Samsung and Toshiba with the only monolithic 32 Gb NAND chip that fits into a standard 48-lead thin small-outline package (TSOP). The companies stated in the announcement that the development of the technology process is going along well and is actually ahead of schedule with the ability to provide companies to create greater capacities of NAND Flash memory for devices like cameras, phones, media players and computers at a lower production cost than what is currently available. 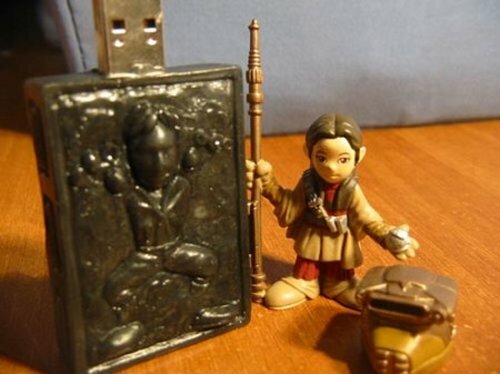 Celebrate Han’s not so eternal Carbonite nap with this USB flash drive. Although I don’t remember Han’s legs looking all frog-like. I also don’t remember Leia looking like a Hobbit. Still, it’s fairly adorable in a Star Wars Babies kind of way. We hope that this drive will hold your data better and longer then it held Han. 1 full GB of data/carbonite for $25. Kingston’s DataTraveler DT150 USB flash drive has reached the 64GB storage mark, making it the top dog of DataTraveler USB drives. Chances are you won’t run out of space unless you really really love video. The size makes it a great portable backup drive. The Kingston DataTraveler 150 works with Windows Vista, XP, Windows 2000, Mac OS X 10.3 and Linux 2.6 and above. Your $177 purchase will get you a five-year warranty and 24/7 tech support too. Today SanDisk has likely pleased at least a few more professionals in the digital photography and videography world with the introduction of the new 32GB Extreme III CF card. 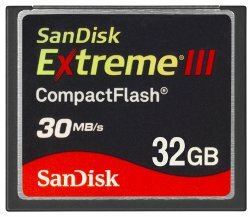 Not only have they doubled the capacity of the largest CompactFlash card SanDisk previously had available, but they’ve also bumped the read/write speed up from 20 MB/second to 30 MB/second with this new item. Anyone that heavily uses memory cards for digital cameras or video cameras can appreciate how nice it is to have more storage in a single card, and upping the transfer rate by 50% makes the decision to get the larger 32GB CF card just that much easier. Sure you can generally get an SDHC card for a little less money and they are a little bit smaller, but the transfer rate is what will make a difference. The Kingston 32GB SDHC card for example can hold just as much, but moving the card’s entire capacity of data is the difference between about 18 minutes for the SanDisk CF and 2.2 hours for the Kingston SDHC. I feel like I’ve just been slimed with this item. Call me a dork, but the Ghostbusters movie is a classic. And I can’t think of anything better then getting the movie pre-loaded on a flash drive from PNY. The drive offers 2GB of storage capacity. The only question I have is in regards to the format of the movie file. The 2GB drive is able to store 12 hours of video, 33 hours of music, or 1,080 pictures. No pricing info yet. Apparently this is the first time a full-length movie has been released via a USB flash drive. Why Ghostbusters? Why not! 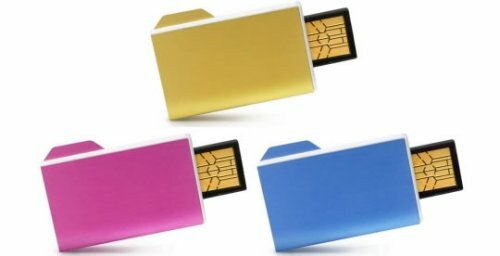 The Folderix USB flash drives from Art Lebedev, the team behind the Optimus Maximus keyboard, are designed to look like a folder icon, and feature 4GB of storage space. We told you about these when they were still in the concept stage. The good news for those of you who want them is that they are now available from the artlebedev.com website. The price is $55 and you get three colors to choose from: yellow, pink or blue. The case material uses multiple colors of aluminum with a laser-etched logo. Many gadget makers are looking for unique ways to stand out while providing eco-friendly alternatives to plastic gadgets. 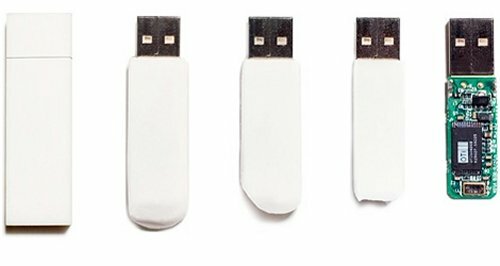 As far as USB drives go, this one manages to be both environmentally friendly and able to stand out from the crowd. As a bonus it will hold your data. The NAND based flash drive will be available in 128MB, 256MB, 512MB, 1GB, 2GB and 4GB sizes. The high speed USB 2.0 memory stick resides inside a hardened bamboo shell that can last forever. It comes with a bamboo slide box, so you’ll always know where it’s at. Plus it looks really stylish sitting on your desk. Lenovo is showing some olympic spirit with their new line of Mascot series flash drives, which will remind you of the Olympics and it’s mascots long after they are over. 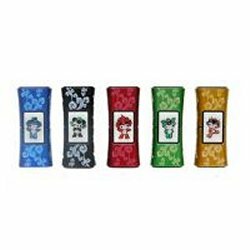 The series consists of 6 colorful 4GB units that will cost around $30 each. Lenovo didn’t just go all Olympic wild suddenly for no reason, they are the official flash drive designer and manufacturer for the event. They’ve got another series that resemble medallions. If those don’t light your torch, how about an extremely limited edition drive set of five 1GB titanium drives in a special mahogany box? 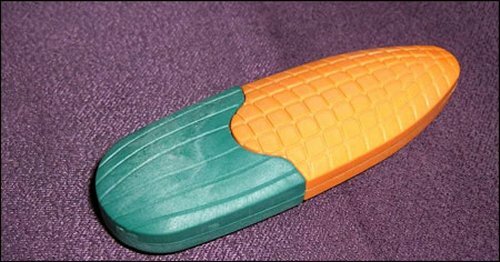 And since it’s made of the corn-based plastic called polylactide, they fashioned it into the shape of an ear of corn. The material can be easily broken down. There’s not a lot of information on the device, but they have apparently made the entire drive biodegradable, and not just the casing. Aside from the obviously corny design, that’s good news. No one wants a bunch of flash drives in landfills. 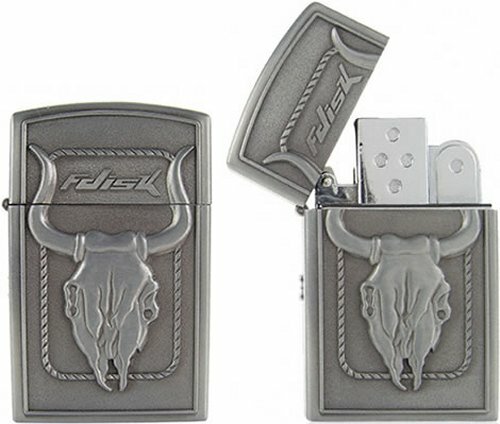 Chinavision is now offering a refillable Zippo style metal lighter that comes with a 4GB USB flash memory. It will allow you to both smoke things and store things like the 21st century Marlboro man. Just like a real Zippo, it’s refillable. Looks like it only comes in cowboy cow skull flavor. It will cost you about $27. Just be careful you don’t fry your data. I’m surprised that zippo hasn’t started doing this. I bet they will pretty soon.